Hokkaido Shinkansen (between Shin-Aomori and Shin-Hakodate, 149km) began its operation on March 26th, 2016. At Shin-Hakodate-Hokuto station, which will be a new gateway to Hokkaido, a flow of many passengers has been generated. The first thing you see in front of the Shinkansen ticket entrance at this station is stained glass public art by Takenobu Igarashi, a Hokkaido born sculptor and designer. In advance of the opening, on March 19th, a lighting ceremony took place to unveil the work. To complete this work titled as “Muku Muku – homage to water, light, and earth”, Igarashi, born in Takigawa city, drew an original drawing with a theme of rich nature in Southern Hokkaido surrounding Onuma Park, and at “CREARE Atami-Yugawara Studio”(Atami in Shizuoka prefecture), it took over half a year to turn it into a stained glass work. 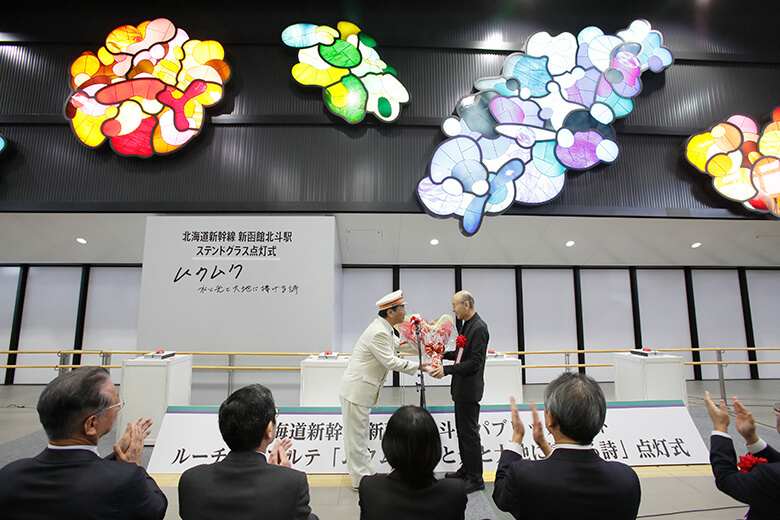 The work using about 85 colors and 420 pieces of glass is comprised of five themes, representing “Lake Jyunsai”, “Komagatake”, “Lake Onuma and Lake Konuma” and “images of flowers” (two kinds). Also, the flower of Hokuto city is marigold and Igarashi had that in mind when creating the work. 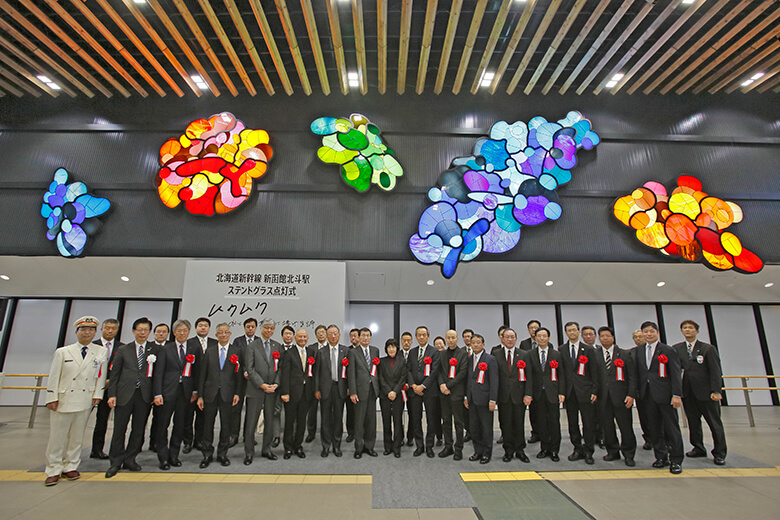 This stained glass was planned by Japan Traffic Culture Association and　the installation was made possible in corporation of JR Hokkaido and with co-sponsorship of Seibu group (Seibu Holdings Inc., Prince Hotels Inc.). When you use the Shin-Hakodate-Hokuto station, we hope you enjoy this Luce Arte, Muku Muku.